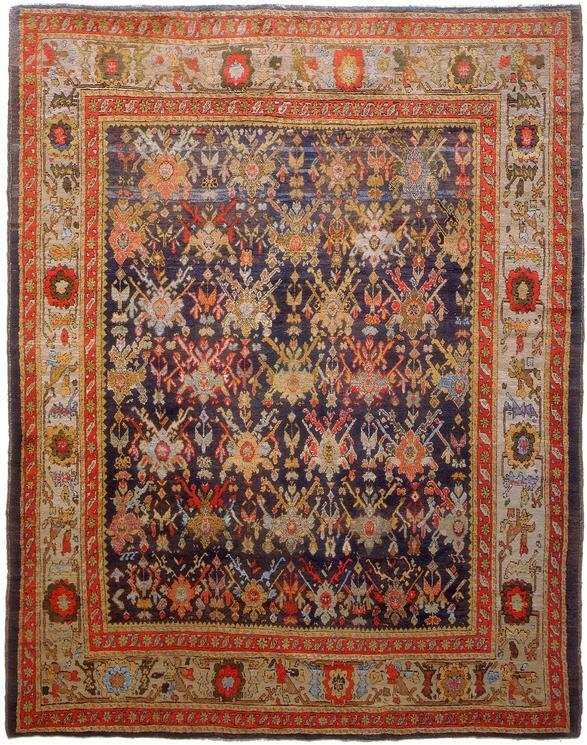 Oushak - 10' x 12' 10"
The carpets produced in Oushak, western Turkey, during the later nineteenth century present the viewer with an unusual combination of qualities. Prized for their lustrous, silky wool and supple handle, they possess the robust scale and drawing of smaller tribal rugs while also drawing on the more sophisticated design tradition of large-scale urban carpets. During the eighteenth and nineteenth centuries the Classical tradition of Turkish weaving established at Oushak gave way to a bolder weaving style more typical of village production. When the Oushak workshops began competing with the Persian weaving industry in the production of larger decorative carpets for the western market, rugs of this kind were the result. The basic design scheme is analogous to Persian Mahals and the like, but the spontaneous; village drawing produces a much more exciting effect, despite the extensive repetitions of the allover palmette design. Oushaks often tend to be muted or pale in color. This one is not, and the contrast between the varied blues and green and the reds and oranges here reinforces the spontaneous, excited quality of the drawing.